12. Our planning vision is to promote sustainable development of Lantau by balancing development and conservation needs. 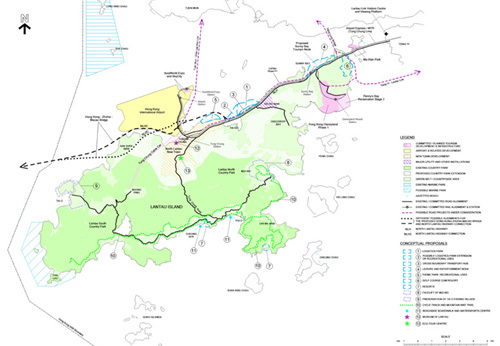 The overall planning concept is to focus major economic infrastructure and urban development in North Lantau to optimise the use of the existing and planned transport links and infrastructure, while protecting the other parts of Lantau, which comprise primarily high-quality landscape and ecologically sensitive natural environment, for nature conservation and environmentally sustainable recreational and visitor uses. The Concept Plan for Lantau is at Plan 1. (i) to conserve the cultural heritage of Lantau and high-quality natural landscape and ecologically sensitive natural environment, including the Lantau North and Lantau South Country Parks, the proposed Lantau North (Extension) Country Park, as well as the potential site for designation as marine park in the waters around Southwest Lantau. 15. The development of future transport infrastructure for Lantau would take into account the HZMB and other major projects. The traffic impact of the new initiatives for tourism, logistics and other developments in Lantau would be assessed in the course of the feasibility studies. 16. Packages of highway projects have been proposed to meet the traffic demand in Lantau and the Northwest New Territories. 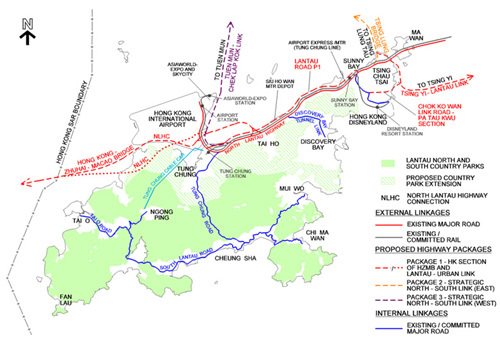 Possible road projects in Lantau include the Lantau-Urban Link, which mainly comprises connecting infrastructure linking the HZMB to North Lantau Highway, Lantau Road P1, Tsing Yi-Lantau Link and Pa Tau Kwu Section of Chok Ko Wan Link Road (Package 1); Strategic North-South Link (East) (i.e. Tsing Lung Bridge) (Package 2); and Strategic North-South Link (West) (i.e. Tuen Mun to Chek Lap Kok Link) (Package 3). These three packages together represent the maximal network now identified for Lantau. They will be subject to continuous review to suit the planning assumptions and latest circumstances. The relative priority and implementation timeframe of the projects will be assessed in the light of studies under way and the growth in traffic demand. 17. To improve the capacities of internal roads in Lantau, widening of Tung Chung Road and local upgrading roadworks in South Lantau are being undertaken. With these improvements, the vehicular link between North and South Lantau will be enhanced. The current permit system on using these roads will be subject to review with due regard to the road capacities. The current traffic restrictions for the Discovery Bay Tunnel Link are envisaged to remain. 18. Many of the proposals in the Concept Plan would be designated projects under the Environmental Impact Assessment (EIA) Ordinance. They would be subject to feasibility studies including EIAs. The cumulative environmental impacts would also be addressed.